Marcella “Marcy” (Kern) Tabery was born on December 20, 1925 to Simon and Theresa (Entringer) Kern of Bluegrass, Minnesota. She attended country school at District #11 school house in Leaf River Township. Marcy was employed at J.C. Penney and Ogards Clothing Store in Wadena for a number of years before she married Donald J. Tabery on September 2, 1950 at the St. Hubert’s Catholic Church in Bluegrass, Minnesota. Their marriage was blessed with six children. They moved to California, bought a ranch in Palmdale and then after a few years they decided to move back to be closer to their family and started Kern and Tabery Construction with Simon and Don Kern. Marcy loved her family and was a meticulous homemaker and gardener. She enjoyed traveling, casinos, playing bingo and cards, shopping and just spending quality time with her children, grandchildren and great grandchildren. Marcy was a member of Christian Mothers, American Legion, and VFW Woman’s Auxiliaries. 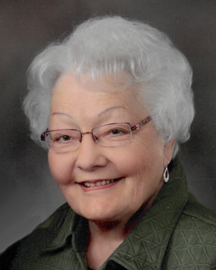 Marcy entered eternal rest on Friday, February 8, 2019 at her home in Wadena, surrounded by her loving family and the gentle care of Knute Nelson Hospice. She will be dearly missed by all who knew her. Marcy is preceded in death by her parents; husband Donald in 2012; sisters: Sally Dunblazier, Romaine Heffelfinger and Lorraine Kern; brothers: Donald, Franklin and Gerald. Marcy is survived by two daughters: Roxanne Tabery and Melissa Tabery (Jeffrey Halland); four sons: Craig, Kevin (Carol), Kenneth (Gayle) and Keith all of Wadena; eight grandchildren: Christopher (Farrah) Tabery of Alexandria, Carrie (Kevin) Rossow of Rochester, Shelby (Paul) Hunke of Wadena, Ryan (Molly) Tabery of Wadena, Sarah (Brady) Dykema of Dilworth, Donald (Kaitlin) Tabery of Rogers, Jason (Louisa) Baker of London, UK, Jennifer Baker of Elbow Lake; 11 great-grandchildren: McKenna, RyLee, Norah, Owen, Madison, Jackson, Conor, Morgan, Hadley, Eva and Maria along with a host of other relatives and precious friends.